When did people become so sensitive? In the last month I’ve read countless articles along the same theme; “Don’t ask me if I’m going to try for a girl/boy, third child, when I’m going to get married / co-habit / start dating, when I’m going to have a first baby?” etc. As a person who suffered four miscarriages before having my baby, I understand from personal experience that in certain circumstances answering those questions can be painful. There were times I thought I’d burst into tears when strangers enquired whether I had any children whilst I was still suffering the physical affects of a failed pregnancy. For me, the children question was a painful one to answer. But the same is true of almost any question. “What did you have for lunch?” can be painful if you have an eating disorder. “Where do you live?” can be painful if you’ve recently had to move as the result of a divorce or financial problems. The people asking the questions aren’t trying to offend and I doubt they even care about the answer. They’re just trying to make friendly conversation. If people don’t stop being so frightfully sensitive the only legitimate form of conversation will be to talk about the weather, or worse, saying nothing at all. With loneliness becoming a modern epidemic, we should be encouraging small talk not making people go about in silence for fear of inadvertently offending. Charlotte Iris Rogers was born at 7.56pm on Valentine’s Day weighing 8lb 6oz. I was lucky to have a very positive birth experience. My waters broke in the morning five days before her due date. Contractions started about an hour later and after an initial check at the hospital I laboured at home in the bedroom keeping nice and calm thanks to a mixture of relaxing music, movement and a TENS machine. At about 4pm I decided I wanted to go to the hospital. I felt that I could have stayed at home longer if I wasn’t scared about how I would cope with the contractions in the car. I’m pleased I decided to head in when I did as when I got to the hospital I was already fully dilated! I got into the birth pool and had a lovely transition period during which I chatted to the midwife and my husband whilst working through the contractions and eating the best tasting flapjack I’ve ever had. Unfortunately the pushing phase went on longer than the midwives wanted (they only like you to push for an hour at which point they become concerned about feral distress and mother’s exhaustion) so I had to get out of the water and have a monitor attached. They made me put my feet in stirrups to ‘open my pelvis’ which I was initially upset about as the contractions were considerably more painful lying on my back and I didn’t have any pain relief but a lovely (and firm) midwife insisted and I ended up give birth on the bed. Thankfully it only took about 20 mins and after the birth I announced that it was much more enjoyable than I expected and I’d happily do it again (obviously high on happy hormones)! I had a second degree tear which needed stitching but that was relatively painless (with the help of a local anaesthetic and some gas and air) and completed very quickly. Once I was stitched up Charlotte had her first feed before I had a shower and we were all moved to our own room on the post natal ward. We were in hospital until the next morning and were then discharged by 10am on Sunday morning. Charlotte is amazing. She’s cute, demanding, funny, sometimes angry, sweet and overwhelming all at once. 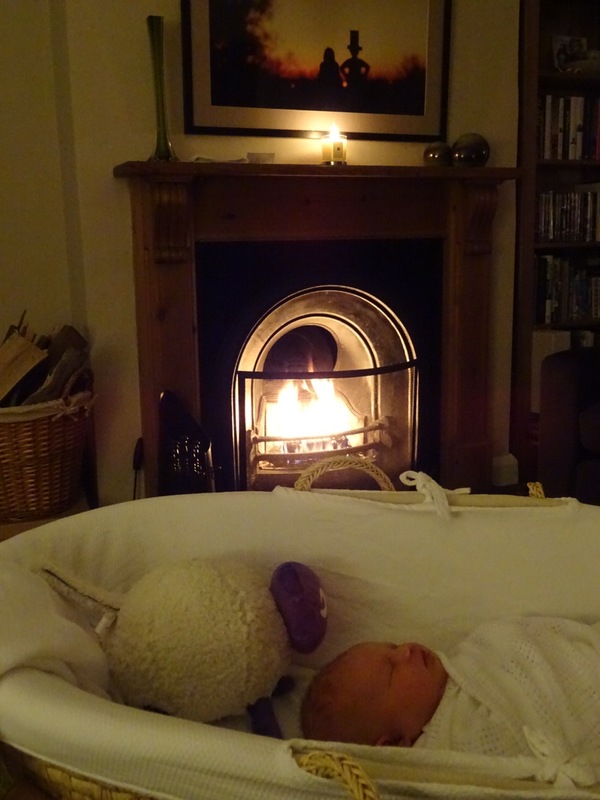 It’s like every moment is a new learning experience and yet at 5 days old it’s as if she’s always been here. I’m almost 39 weeks pregnant and so I’m officially in the ‘waiting’ phase. If you’d asked me three weeks ago if I thought I’d still be pregnant now I would have said no. At 35 weeks I had the bloody show/lost my mucus plug and baby’s head became engaged. At that point I was told by two midwives that baby would most likely arrive in the next two weeks. This resulted in a bit of a panic when the boy and I realised that we weren’t ready at all. Since then we’ve finished the nursery, packed our hospital bag, fitted the car seat and generally got prepared for our forthcoming arrival. But so far, no baby. I feel like I’ve had all the signs that the baby will arrive imminently. Bloody show – check; head engaged – check; bump dropped – check; constant need to wee – check; loads of braxton hicks contractions (even when sitting / lying down) – check; loose bowels and increased discharge (sorry for TMI) -check. So for now I’m just waiting. I really, really don’t want to be induced so I hope that our baby makes an appearance in the next few weeks. However, today I have a horrid head cold and feel rubbish so I’d be happy for baby to stay inside for a few more days as I’d rather not labour whilst feeling like this! I still don’t think it has sunk-in that we are actually going to have a baby but I think that’s because it’s impossible to imagine. From talking to friends I think this is quite normal so I’m just going with the flow and hoping that I’ll discover some inbuilt mummy skills once the baby arrives. I’ve been trying to stay active and still walk the dogs twice every day (even though it’s now more of a slow waddle). I also go to two yoga classes each week and I’m listening to a natal hypnotherapy CD every few days. I don’t know if these things will help with labour but they are helping me to feel more in control and prepared so I’m going to keep it up as long as I can. Fingers crossed in my next post I’ll be able to tell you about the safe arrival of our long awaited (lucky number 5) baby (just writing that still feels completely surreal)! This time last year I’d just been released from hospital and was at the start of months of testing to check that the molar pregnancy had gone. In April I got another BFP only to suffer another miscarriage (#4) on our wedding anniversary. What I didn’t know then was that the next cycle would result in a fifth pregnancy which would take me to today. 33 weeks pregnant and looking forward to the arrival of our baby next month. I haven’t found being pregnant easy. I wish that I was able to enjoy it more but the fear that something will go wrong doesn’t seem to go away and the almost constant nausea is quite draining at times but it will all be worth it if we get a happy healthy baby at the end. In exciting news my sister announced on Christmas Day that she is also pregnant (first baby, unplanned – I still don’t know how that happens!). She is currently 11 weeks but has yet to have a scan. Obviously this has me terrified that something will go wrong and the arrival of our baby will coincide with her recovery from a miscarriage but I have to keep reminding myself that she isn’t me and that 75% of pregnancies are successful so there is no reason why this won’t work out and our baby won’t have a little cousin to play with come August! The bloggers network has continued to be an invaluable source of support for me over that last year. There have been many moments of joy and times of crushing sadness but the support which this network of women has shown to me and each other is inspiring. There is much said in the press about how social media is damaging human interaction and making people more isolated and lonely but I don’t know how I would have got through the last two years without this blog and the support of all of you. Bruised Banana’s latest blog made me realise that I’ve been absent from my blog recently. At my last blog I was 24 weeks pregnant and experiencing a small amount of bleeding. I did provide an update to say that all was ok but I’ve realised that the update was in the comments not the blog itself. Thankfully the bleeding seems to have been minor and although it’s happened a few times since it hasn’t been problematic. Fingers crossed this doesn’t change. I have continued to read and comment on blogs but I’ve found it difficult to know what to say about myself. I’m 28 weeks pregnant now and all seems to be going well. We still haven’t bought much stuff for the baby as it feels like tempting fate but I am starting to believe that we will get our baby in February. I will continue to provide periodic updates but don’t seem to be able to do the weekly updates which lots of pregnant bloggers do. The truth is I’m finding pregnancy hard. I feel like my body isn’t mine, I still feel sick every morning and struggle to get comfortable at night. I still worry every time I use the toilet and hope for no blood and I can’t stop worrying about early labour or still birth. I have experience of bad things happening and can’t stop worrying that something will go wrong again. All that sounds a bit negative but I promise I’m really happy to be pregnant and really looking forward to being a mummy. RPL will always be part of my life but I’m hoping that the memories of my losses will soon sit alongside memories of a successful pregnancy and life as mother. For those still going through RPL, I know how hard it is to keep trying and how hard it is to read about other people being pregnant but I hope that my story can show that unexplained RPL can lead to a successful pregnancy. I’m 24 weeks and 3 days pregnant and I’m currently in hospital waiting to see a doctor after experiencing some bleeding yesterday evening. To say that I don’t want to be here is an understatement. I was hoping that I wouldn’t need to come to this hospital (other than for routine scans) until I was 40 weeks pregnant and in labour but it seems that as with everything to do with me and pregnancy, it isn’t going to be that simple. The good news is that the baby is fine. I’ve heard the heartbeat and all is good but so far there is no explanation for the bleeding so I’m waiting to see a doctor for an examination. Please let it be nothing serious! Firstly apologies for the lack of updates. If I’m honest I’ve been struggling to think of what to say. I’m very conscious that I started my blog as a way getting help and support during my struggle with recurrent pregnancy loss. Now that we have made it over half way with pregnancy number 5 I don’t want to feel like I’m rubbing my good fortune in the faces of those why have supported me and are still struggling with their own battles. I also find that thinking about the pregnancy too much makes me feel quite anxious so I’m better just taking each day at a time and trying not to over think. For those who are interested (and I completely understand if you are not in a place where you want to read about pregnancy and babies – I’ve been there), we are now 21 weeks pregnant. We had our scan yesterday and everything is looking good although I do need to go back for another scan in a couple of weeks as the baby’s position didn’t allow the sonographer to get a good look at the baby’s spine. I don’t really have a bump yet but have definitely put on weight (probably a bit too much but I can’t face the scales) so I’m currently feeling a bit tubby and unattractive rather than blossoming and maternal but I’m guessing the bump can’t hide for much longer so I should be looking pregnant in the next few weeks. As for the nausea, I’m feeling a lot better and have much more energy but I still have waves of nausea at points during the day and the excess saliva and horrid metallic taste have not subsided so I fear they may be here for the whole journey. The boy and I had a great break in Croatia last week. The weather was lovely and it was great just to chill out and spend some quality time together. I think we might try to get in one more break before the baby arrives next February but we’ll see how things go. mylifeasacasestudy on I’ve been dumped. GK on I’ve been dumped. I was given a one percent chance of conceiving. I hope to share my journey with everyone in hopes that it will make the journey for someone else a little easier. I am not a medical professional. I am just a normal person trying to understand my own situation and share my story. **If this is your first visit, please start with the timeline. For greater details on the events, follow the hyperlinks. The beautiful, funny & unsightly truths about raising 3 year old twins & an 8 year old singleton... with one on the way!